Surviving the Death Zone - Antibiotics - Does It Matter How You Give Them? I'd never thought much about how antibiotics were given. You diagnose an infection, follow the local policy and prescribe the antibiotic. If you were lucky, the microbiologist would call and give you something specific to treat. Job done! However, there's now evidence to support the idea that the way you administer antibiotics might make a significant difference to the patient. Recently, a meta-analysis reported that intravenous antibiotics given over at least three hours, resulted in a 30% reduction in mortality when compared to antibiotics given over an hour or less. If you look a little closer at the meta-analysis you'll find that the authors went to considerable efforts. A very strict entry criteria meant that a total of 2196 publications were reduced down to just 22 randomised controlled trials (RCT's). Whilst several small methodological differences were found between the RCT's the message can be clearly seen. The vast majority of studies identified a small improvement in mortality that rarely reached statistical significance. However, when these were analysed together, the difference in in the number of deaths was striking - 159 (an hour or less) vs 109 (3 hours or more) in a population of 1597 patients. Why should the duration of antibiotic administration make such a difference? Beta lactam antibiotics (penicillins, cephalosporins and carbapenems) work by inhibiting cell wall synthesis. Put simply, they split the walls of bacteria apart and cause their contents to spill out. These drugs work when they're circulating above their minimum inhibitory concentration (MIC). However going far beyond the MIC has little effect on bacteria and simply increases the risk of side effects. 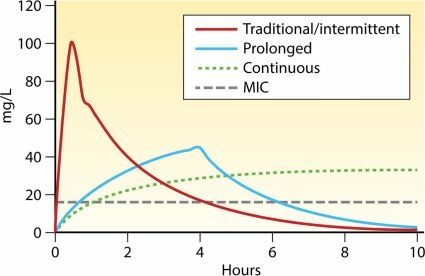 With conventional dosing, the concentration of beta-lactam antibiotics quickly drops below the MIC, however with prolonged or continuous administration the concentration stays above MIC for much longer. This leads to greater rates of bacterial destruction and, as this meta-analysis shows, better outcomes for patients. The plasma concentration of beta lactic antibiotics remains above the minimum inhibitory concentration (MIC) for much longer when given as a prolonged or continuous infusion. So why isn't this approach more commonly used? Unfortunately there are a number of obstacles that lie in the way. Most obviously, any patient that needs continuous intravenous antibiotics will need to be hooked up to a syringe driver or pump for several hours a day. This might not be an issue in ITU but in clinics or on the ward it's likely to prove disruptive. Antibiotics may not be compatible with other medications and therefore multiple intravenous lines may be required. Some intravenous antibiotic solutions often become unstable when kept at room temperature for long periods of time. A good example is meropenem that manufacturers claim is only stable for one hour at room temperature. This issue may just be enough to prevent manufacturers from investing in the research that is needed to identify the most effective way to infuse antibiotics. In some cases it may lead physicians and pharmacists to use a "best guess" approach instead. Nevertheless, at a time when antibiotic resistance is growing, the results of this meta-analysis should prompt physicians and pharmaceutical manufacturers to look closer at a better way to administer our current range of antibiotics. Please get in touch if you want a copy of the meta-analysis.